2.5" x 3.5" rectangular. Made in USA. Add headless style to your fridge, locker or office with this shot of the horseman and his trusty steed in Sleepy Hollow Cemetery. This cozy hoodie will "protect your head" and keep you warm on the coldest and darkest of nights! Hoodie comes in black. This hoodie has the headless horseman on the front and a verse from The Legend of Sleepy Hollow on the back. And now our popular hoodies come in burgundy! Halloween is always right around the corner when you've got this glossy pic of the headless horseman on your fridge! Our newest shirt captures the dreamy, bewitched atmosphere of Washington Irving's short story "The Legend of Sleepy Hollow." Black shirt features the Headless Horseman, the Sleepy Hollow bridge, and the actual church and churchyard from "The Legend" against a backdrop of stars and an ominously full moon Protect your head in the Hollow with these fashionable knit hats. We hear the horseman is attracted to uncovered heads. Comes in tan, gray or black. Look for our table outside the south gate to Sleepy Hollow Cemetery in Sleepy Hollow, NY. Weather permitting, we will be there weekends throughout the summer and fall. Stop by to say hello! Feel free to drop us a line and let us know if there's anything you'd like us to add to our shelves. In town and don't see us? Email or call us and we will be happy to help you out! Thanks for visiting and thanks to all who have supported our efforts now and in the past. 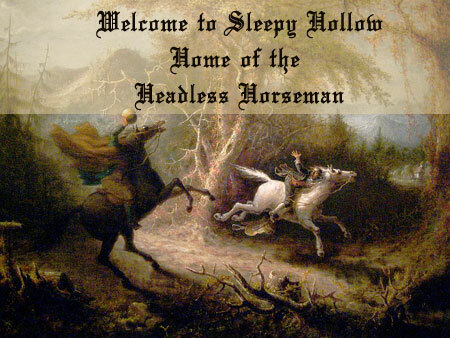 Planning a visit to Sleepy Hollow? Download our FREE visitors guide. You'll also find lots of free information at VisitSleepyHollow.com and SleepyHolloween.org.